Albany - Sam's Log Cabin  What came first, the free-range chicken or the organic egg? Dr. Biggles who has yet to steer me wrong, recommended Sams. I liked it. Almost everything here is organic, eggs, chicken, coffee, etc. There are homemade fish sticks (usually catfish) and you can even get fish sticks with eggs. The Swedish pancakes were looking good. Theres the fresh fruit mango raspberry and yogurt parfait served in an old fashioned shake glass. It looks too good to be healthy. The orange juice is so fresh it is squeezed to order. Theres a big bin of oranges cut in half and the server uses an old hand press for the juice. What is excellent is that you can have it your way. While the menu is brief, theres lots of mix and match. Not interested in toast? Substitute a house made scone, muffin or coffee cake for a slight extra charge. Todays muffin was strawberry. It was a little sweet, but tasty and had a good texture. Instead of the excellent looking home fries, you can substitute fruit salad or sliced tomatoes. The fruit salad was almost up there with Bettes. Today there was mango, papaya, strawberries, honeydew and bananas. All the cut fruit was ripe and good quality. In addition to fish sticks with your eggs there is also Hobbs ham, Hobbs bacon or sausage. Sams uses sustainably-raised meat. These items are served with real maple syrup or, for an extra charge, home-made, warm, mixed berry syrup. Sams has its fans and critics on Chowhound. I can see both sides. The fish sticks were good, but fried too long and black on the bottom. The tarter sauce with it is excellent and I read that sometimes there are Meyer lemons to squeeze on the fish sticks. The plain scrambled eggs were made the way I absolutely hate them, the folded type that were soft cooked. The special scrambled eggs were more in line with how I like my eggs. It was early and the music was a little too loud and pounding. It was HOT in there and the smell of frying fish sticks and pork products filled the place, not in the best way. However, there was more good than bad and I like the healthy options. I liked the strong organic coffee served in the type of mismatched mugs that are picked up on sale. Weather permitting, Ill probably sit on the brick patio that is shaded by redwoods and looks out into a little garden with herbs, vegetables and flowers. That should resolve the heat and music problem. 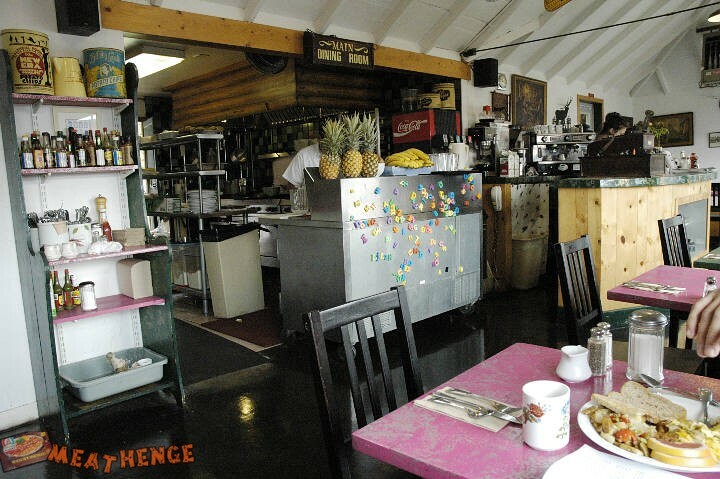 The building really is a log cabin and has been a café since the 1930s. The current owners took over in 1998. In a glass case at the front counter there are a few old Lincoln log sets as well as antique log cabin containers made of glass and tin. Theres an ancient cash register that is still used. The link to Dr. Biggles site shows pictures of the restaurant, patio, interior and some of the food. What isnt seen in the shot of the interior is the ancient egg beaters strung from the ceiling. What you can see is the impressive hot sauce collection on one of the shelves. Thanks Dr. Biggles for another fine tip. Those Swedish pancakes are calling my name. Have you tried them? What type of fruit is inside? The lady at the next table was going on about it, but I caught the conversation too late. 7 a.m. - 2 p.m. Tue.-Fri.
8 a.m.-2 p.m. Sat. & Sun.